This fourth and final instalment sees Bruce Basher venture even deeper into the ‘Big Boys Toys’ realm to bring the delivery of berley – amongst other things – into the 21st Century. I recently purchased a DJI Phantom 4 Advanced drone, mainly for photographic purposes. As the camera really is something special, I wanted to take more fishing photos from angles not otherwise possible. However, it didn’t take long to realise the exciting possibilities offered by the drone for getting lots of lovely berley out into the surf zone, too! The result of this reinforced the fact that effective berleying is now not just the exclusive domain of boat and rock anglers. Who said males can’t multi-task? Sure, there are already drones on the market fitted with line releases that are shop-ready to drop all sorts of lines and berley. Most employ an electric release, operated by pressing a switch or button on the drone’s control. I decided to try the hook method because, basically, I had already used up all my vast stock of brownie points on the purchase of the drone. Yes, I would love to use the electronic unit, because apparently they work very well, but brownie-point debt is a terrible thing! Even Father Christmas ignored my pleas! 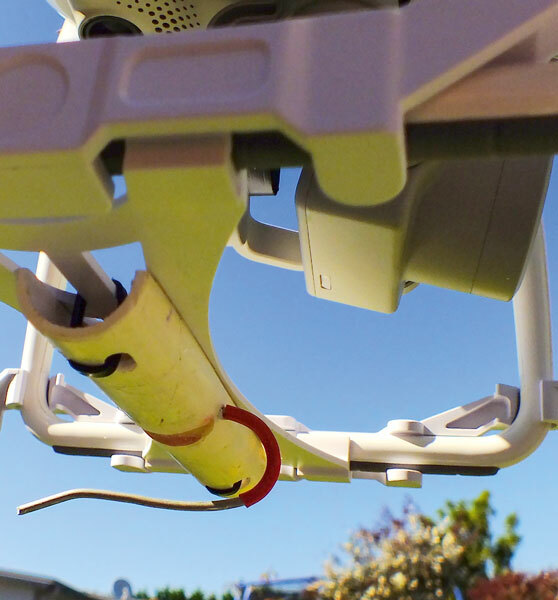 The first thing to consider is: can your drone safely lift the berley’s weight? The manufacturers of the Phantom 4 claim it can lift 30 old-fashioned ounces; that’s about 850g. I use a takeaway coffee cup as a mould for the frozen berley. With a few stones added to make the frozen berley sink, my drone drops about nine ounces (260g) each time – well within its capabilities. To keep the dreaded PC brigade off my back (I don’t usually bother with these time wasters), everything that drops into the water, except the stones, is biodegradable. Even the small piece of stick used to hold the berley onto the string is driftwood previously picked up from the beach. All that is required now is a smart tap on the base to easily dislodge the frozen berley bomb from the coffee-cup mould. These cups are quite sturdy, so can be used many times. Looks like I’m getting ‘greener’ by the minute! So now I have a drone safely lifting a good chunk of frozen berley into the air and out to where I want to drop it. So how does one go about getting the berley off the hook and into the water? Easy – and very cunning if I say so myself! You will need a spinning rod and reel or saltwater fly outfit, filled with enough line to get to where you want the berley placed. 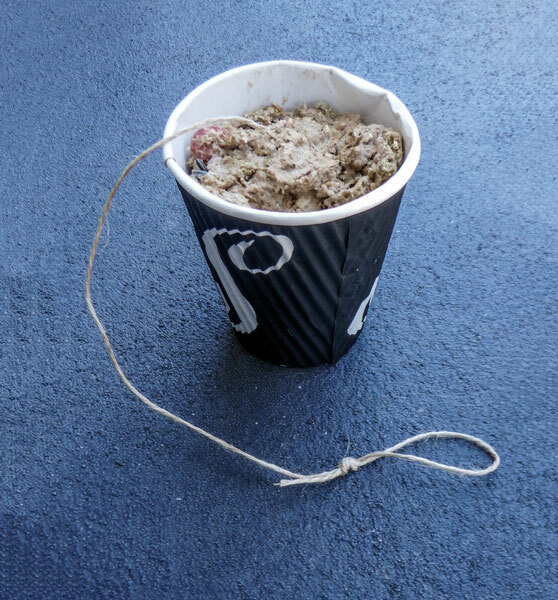 First, tie a length of PVA string – about a metre or so – to the berley bomb’s string. Then tie the other end to the spinner or saltwater fly. I have my drone’s hook pointing to the rear, so it doesn’t interfere with the camera, but this does mean I must reverse my drone out to the drop point. Dropping the berley is as easy as turning the drone around 180 degrees and flying it away from the beach, whilst stopping any more line coming off the reel. The string loop is pulled off the drone hook, so the berley and lure drop into the sea. Easy, eh! Now wait a minute or two while the PVA string dissolves before winding in. You have delivered the berley to the fishing zone and now have a chance of a strike while retrieving the lure/fly! For surfcasters wanting a much longer ‘cast’ than usual, substitute the spinner or fly combo for your normal surfcasting gear, and just tie the PVA string to your sinker. The bonus here is that you will have all that lovely berley thawing out right next to your bait. Oh dear, how sad, never mind! I hope I’ve somehow annoyed the PC brigade by now. Perhaps not? Well, let’s start the New Year by annoying those who look down on fishers who, for various reasons, use a kontiki to catch their fish. After all, the drone is just what’s needed to deliver a kontiki line out to sea. Sure, you won’t be able to use as many traces as a dedicated kontiki, but you will increase your chances of taking home a feed of fresh fish. The line is delivered out to sea in much the same manner as the spinner or saltwater fly, and is also dropped in the same way. Just keep in mind the extra weight factor involved, and do a couple of test runs over dry land first. My setup firstly involves tying a sinker to one end of a length of line, about 10 metres long. I then tie a split-ring or solid ring to the other end. The line for this ‘sinker line’ is kept lighter than the mainline, so if the sinker becomes snagged, it will break first. The split-ring or solid ring is placed on the drone hook to carry the line out, with the Kontiki line tied or clipped to this ring, too. Dropping this into the sea at your hot spot involves turning the drone in much the same manner as when dropping the berley. I set ten baited traces on 30 metres of 100lb (45kg) Black Magic Tough line. Thirty metres provide enough room for 10 hook traces and three pill-container berley traces. Yep, you’re going to put some berley out on the Kontiki line, too! Now just clip the kontiki line to a decent overhead reel and rod setup’s mainline. 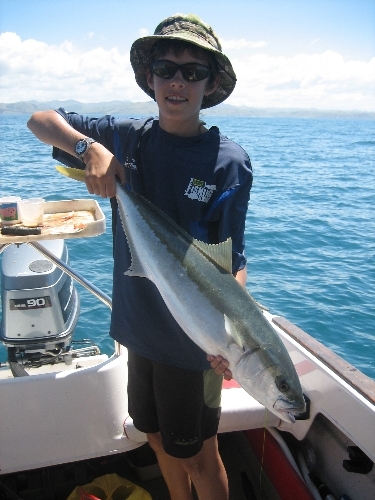 As the kontiki line cannot be wound onto the reel, you will need to disconnect it upon reaching the beach – fully laden with fish, of course! There is one final (but very awesome!) use for the drone. When looking for a good spot to fish, we all know it pays to view the area from some sort of high vantage point. Sometimes, though, this is not possible. Which brings this Berley in the Surf series to an end – hopefully you learned a few things to make your surfcasting more productive. Bombs away!